What’s your number this year? 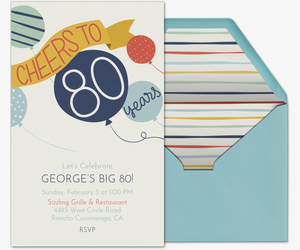 Whatever decade you’re hitting, kick it off with a free or Premium digital Evite invitation. 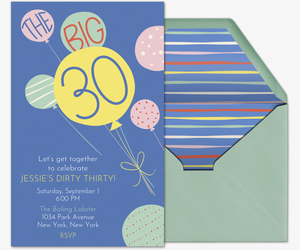 Browse our Birthday Milestones invitation gallery for 40th birthday invitations, 50th birthday invitations, and every other one of life’s big numbers -- 30th, 60th, 80th, 90th, and more. Celebrating a coming of age? Our collection features party invitations for sweet sixteens, quinceañeras, 18th birthdays, 21st birthdays, and bar and bat mitzvahs, too. 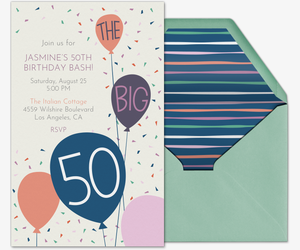 Or, throw a surprise party for the guest of honor with one of our surprise-themed designs. 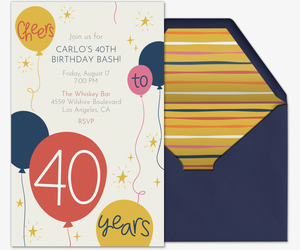 Plus, paperless invitations keep the surprise on the down low -- communicate with guests directly on your invitation page and from anywhere with the Evite mobile app. 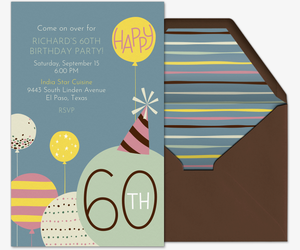 Online invitations make customization a cinch. Write your own personal host message and share photos and messages with guests before, during, and after the event. Planning a birthday potluck? Ask guests to sign up for food and drink contributions using our “What to Bring” feature. Don’t stress over compiling the perfect email list. Once you’ve created your invitation, you can spread the word about your party plans via social media or text using your invitation’s custom, shareable link. This year is major -- mark the milestone with an extra-special Premium invitation. 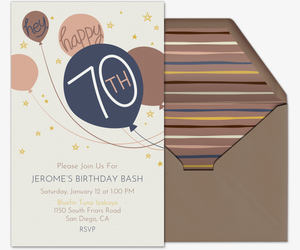 Our ad-free Premium invitations offer the same look and feel as traditional paper invitations and come with matching envelopes and customizable stamps. Premium designs cost $12.99 for 15 guests, $24.99 for 50 guests and $49.99 for up to 750 guests. 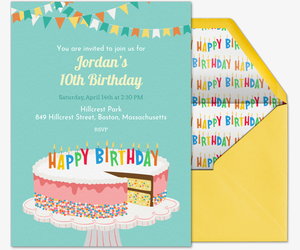 Personalize your invitation by featuring a festive birthday picture on one of our upload-your-own invitation templates, or fully customize one of our design-your-own invitation templates. Go the extra mile for your birthday party with planning tips from Evite Party Ideas at ideas.evite.com. Find out how to personalize a party, celebrate yourself on your special day, and put together a last-minute gathering -- no matter what the candles read. Then get inspired by real parties thrown by people just like you, from sweet sixteens to 30th birthdays. After the party, tell guests “thank you” with our digital Thank You Cards, whether they attended the party or dropped off a gift. 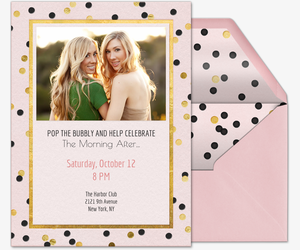 Personalize your note by attaching a memorable snap of you and the guest from your party. Plan all of your milestone parties with Evite. Our galleries feature invitations for all kinds of occasions -- birthdays for kids, baby showers, anniversaries, weddings, graduation, dinner parties, cocktail parties, and many more.